Succulent centerpieces last months and look good long after the occasion you made them for. Shown here are ideas for tabletops, floral-style arrangements, groupings and more. Follow the links for additional info and how-to help. 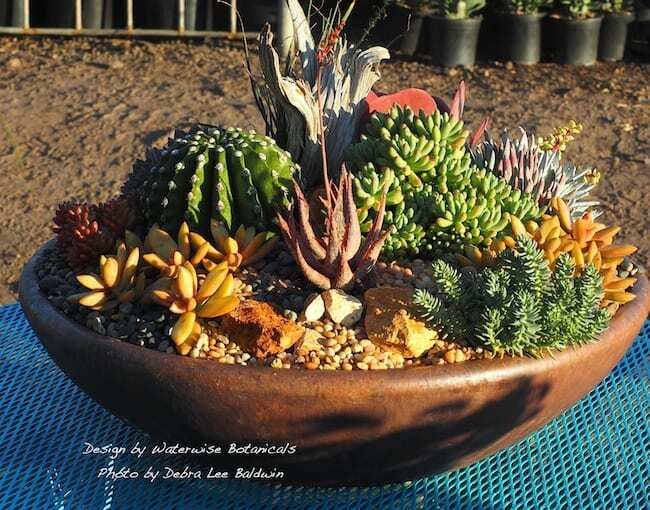 Above: Jeanne Meadow of Fallbrook, CA, keeps this succulent centerpiece on her patio table. 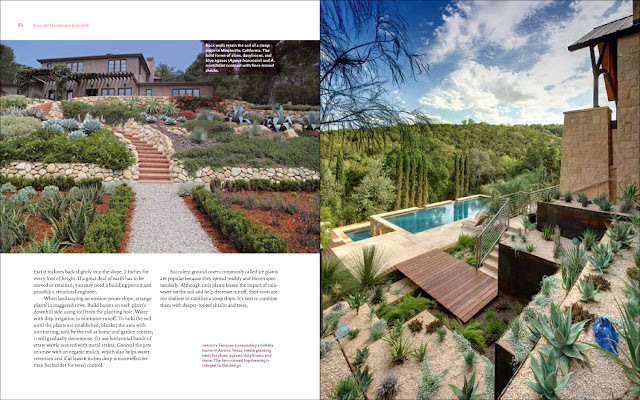 Jeanne’s is one of the featured gardens in Designing with Succulents (2nd ed.). 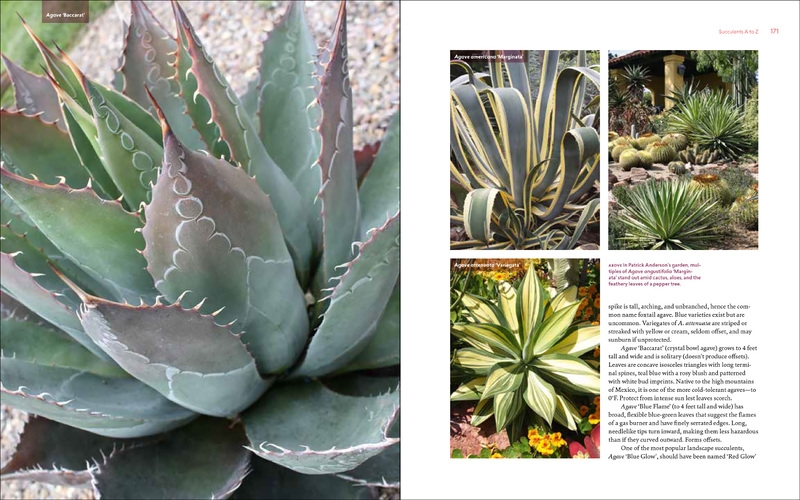 This photo also appears as a black-and-white line drawing in my Sensational Succulents coloring book. It’s an example of the floral-style succulent arrangements shown in my books, notably Succulent Container Gardens. Above: This pedestal-pot succulent centerpiece is by CW Designs (formerly Chicweed). 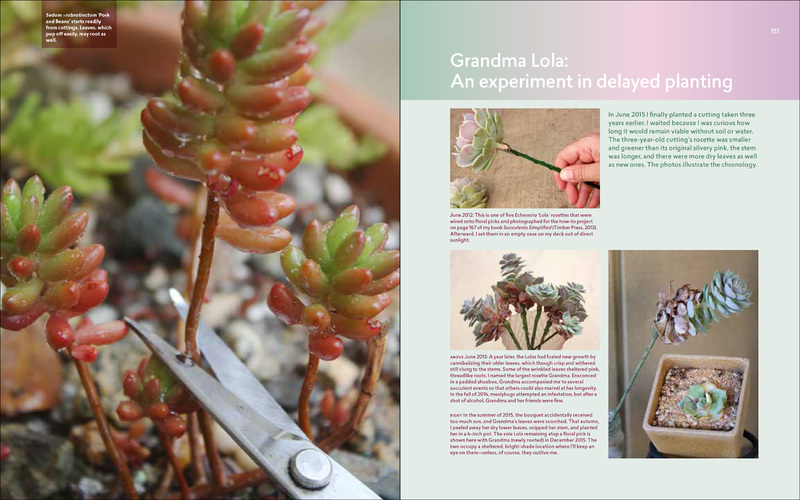 See how to make it in my online article: DIY Floral-Style Succulent Centerpiece. You can watch me make this centerpiece in a repurposed berry bowl in my online Craftsy Class, “Stunning Succulent Arrangements.” Use this link to take my Craftsy class (all seven lessons) at 50% of the regular enrollment price—$20 instead of $40. I also feature the same berry bowl, filled with colorful succulent cuttings, in my YouTube video, Succulents in Silver. To make this unusual centerpiece for my patio, I combined a curved glass tube and a wrought-iron stand (both thrift store finds) with colorful clusters of succulents, then added bird seed. Watch birds enjoying it (and thereby turning it into a piece of kinetic art) in my video: Succulent Bird Feeder Centerpiece. If you’d like to see how I repurpose objects for bird feeders, go to Creative Bird Feeder Materials & How-To. Groupings of similar objects make simple, appealing tabletop decorations. 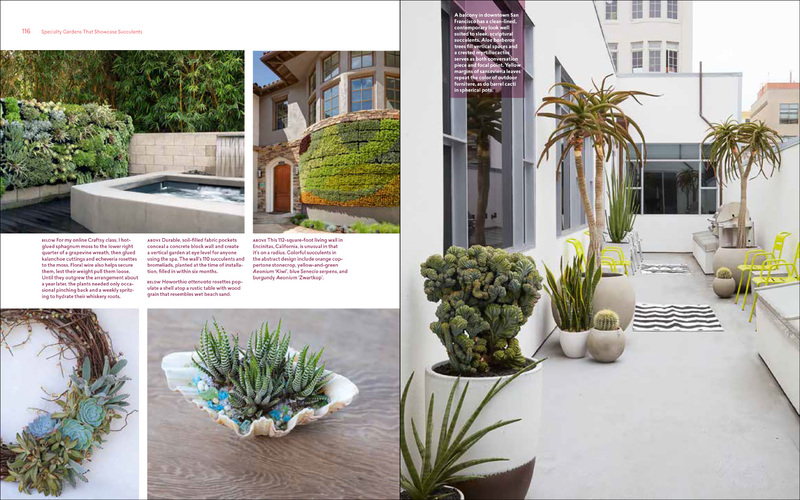 Here, sempervivums look like they’re in white baskets, but—as explained on page 36 of Succulent Container Gardens—they’re actually in cast-concrete pots. Glossy silver balls repeat the muted hues of the pots and contrast with their texture. I made these bouquets for the launch party of my book, Succulents Simplified, which has the same plants on the cover. Marbles serve as ballast and I made faux stems from bamboo skewers. The vases hold water to keep the aloe flowers fresh. 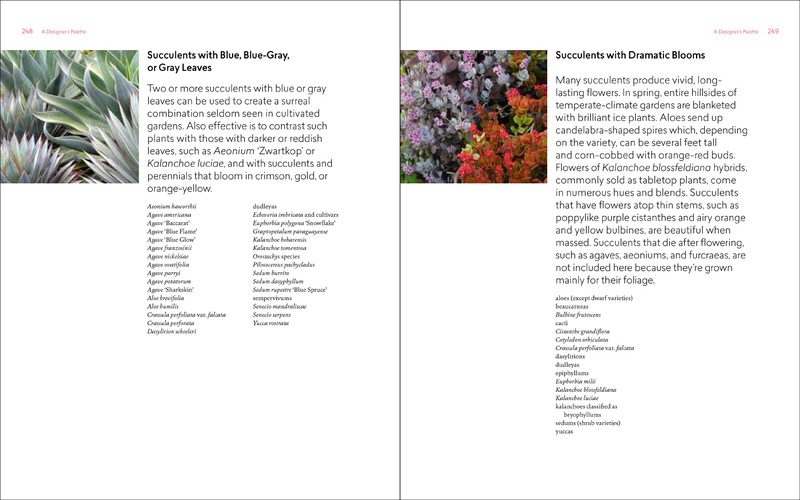 Learn more in my article, Create a Bouquet of Succulent Cuttings and in my online Craftsy Class, Stunning Succulent Arrangements. This dramatic succulent centerpiece features a crested euphorbia. See how it came together in my online article Succulent White-Pot Pairings, and in my YouTube video, How to Pair Succulents with White Pots. Highlights of the Fall Garden Party at Waterwise Botanicals Nursery. There was so much beauty at Waterwise Botanicals nursery near San Diego during the recent Fall Garden Party (an annual succulent event near San Diego), I’ll let the photos I took speak for themselves. Cue rhapsodic music! Just when I feel I’ve seen too many succulent topped pumpkins, one comes along that takes my breath away. 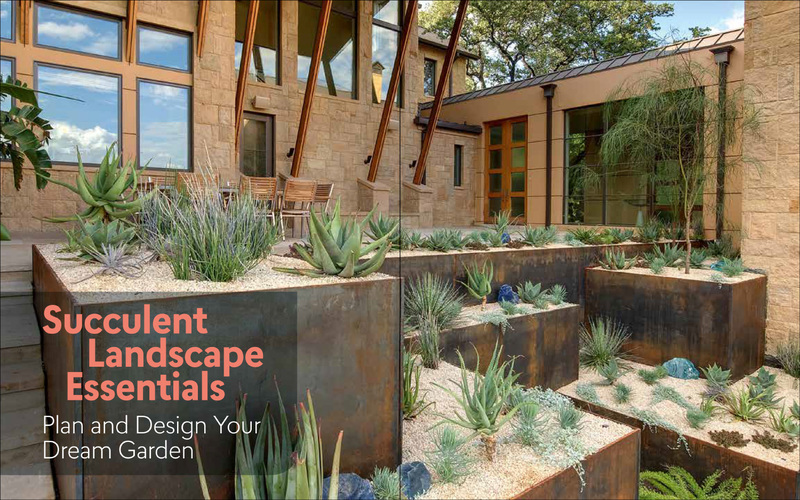 The display gardens are worth visiting, year-round, for design ideas plus practical-yet-lovely plant combos. The staff makes lovely dish gardens for sale. No two are like. At my booth during the event, I did impromptu plant-pot pairings. The best way to select plants for a pot is to take it to the nursery with you. Who would have expected purple pleiospilos to be perfect for this whimsical fish? Yet when the two were alongside each other, it seemed obvious. Metal clay artist Lucy Ellen of Escondido stopped by my booth to brainstorm workshop ideas. 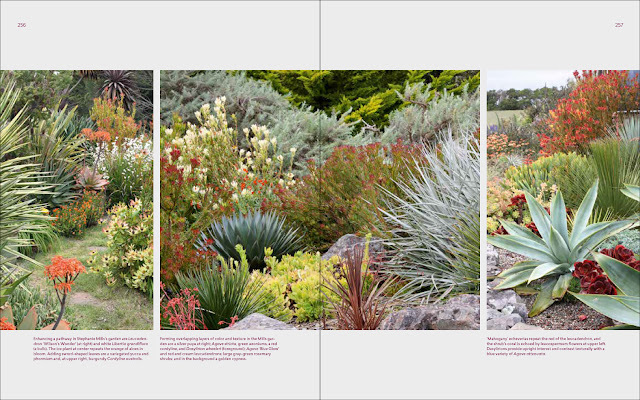 Nursery manager Tom Jesch designed the display garden near the nursery entrance to suggest the desert in bloom. 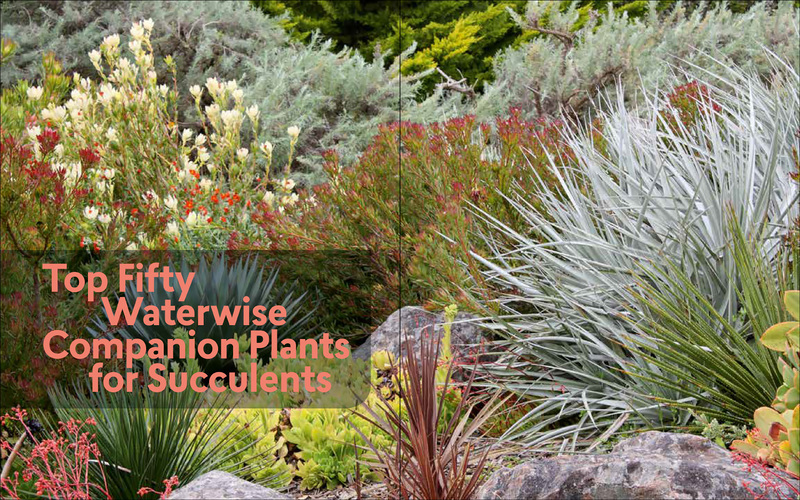 The plants he chose are suited to a more maritime climate. I love the geometry and textures of columnar cacti—especially when illuminated by the sun—don’t you? Silvery blue Echeveria peacockii graces one of the display gardens. A miniature succulent garden at one of the workshops. This succulent holiday tree, made mainly of sempervivums and sedums, was another workshop project. …As was planting driftwood with succulents. An Echeveria cultivar tough enough to grow in the open garden. I believe it’s ‘Sahara’. Over time, this Echeveria ‘Green Crush’ offset to form an impressive, hens-and-chicks mound. Red cryptobergia is a desert bromeliad that makes a colorful, low-water companion for succulents and a great addition to potted combos. Tom Jesch repurposed a toy truck as a planter for succulents. Masses of coppertone stonecrop and graptosedum carpet the ground in one of the display gardens. Columnar cacti, haloed by late afternoon sun, point to festive white tents where workshops were held. Forgive me if this makes you gnash your teeth, but if you didn’t make it to this year’s Fall Garden Party, you missed taking home one of these free one-gallon succulents.